One could be forgiven for thinking that moving to a 5 hour day would leave me with quite a bit of spare time for writing. Unfortunately, having spent a week doing part time work, this theoretical result does not appear to hold in practice. First there’s the problem of the commute. I cycle to work, which takes about half an hour each way, but when you factor in getting changed at either end I lose about an hour and a half commuting every day. 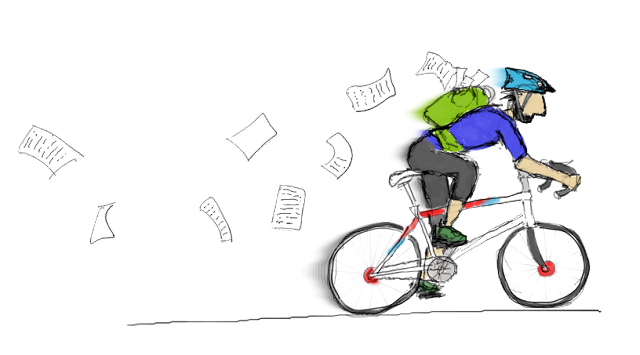 It’s not totally wasted since it keeps me fit, but it’s tricky to write a novel on a bike. Then there’s the fact that the news I write in my 5 hours frequently spills over into my novel writing time. Say +30 minutes. So by the time I’ve left the office, changed into my cycling gear, elbowed a load of taxis out of the way to get home, got changed again and made coffee it’s probably about 4pm. As I sit down at my computer I’m already wondering where the day has gone. Then there’s this other problem. With Central Banking only employing me until the new reporter starts, I need to look for other things that will generate cash for part of my time. The good (and bad) news is there’s quite a bit going on in this regard. In the last couple of weeks I have put together a short research project, been approached about a freelance feature-writing job (which would need to be written in the next two weeks or so) and submitted an application for another job. Ever the ruthless businessman, I haven’t actually been paid for any of this, of course. Still it’s looking promising. The trouble is, all this faffing about looking for money is very time consuming, especially when the majority of the day is still going to Central Banking. The final spanner in the works is the short story – it’s going reasonably well, but it’s not the novel, and with the deadline for the Bridport Prize approaching with the speed of a runaway freight train, I’m starting to wonder how I’m going to get it done in time. Evidently I have nothing to complain about.